In June 2013 Camden Council implemented a number of changes on Royal College Street between Pancras Road and Baynes Street in order to improve road safety for pedestrians and cyclists. The changes included providing 2m wide protected cycle lanes for northbound and southbound cyclists and introducing better crossings for pedestrians. In March 2013 the Mayor of London launched his vision for cycling in London. A major element of the vision is the proposed new Central London Cycle Grid – a network of cycle routes through Central London and the city, making it more attractive to people who don’t cycle and safer for the increasing numbers who do. As part of the Cycle Grid, the Council would like to extend the recent improvements on Royal College Street to the north into Kentish Town and to the south to Kings Cross providing a safe and continuous protected cycle route. 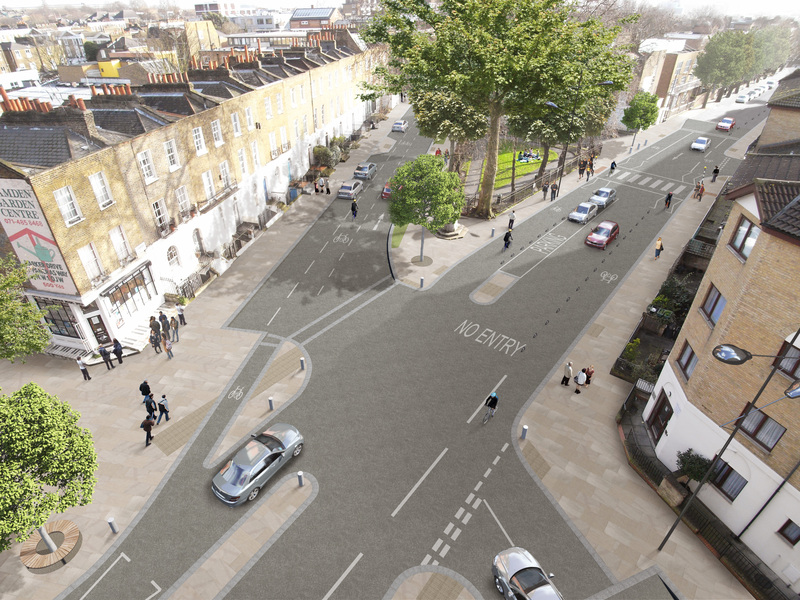 This webpage provides details about the proposals on Royal College Street between Baynes Street and Kentish Town Road. This section of Royal College Street is a one-way road until the Farrier Street/St. Pancras Way junction where it becomes a two-way road to Kentish Town Road. There are poor facilities for cyclists in the two-way section and there is no southbound route for cyclists in the one-way section. In addition, residents in the area have highlighted concerns about traffic speeds and road safety. In response, the Council has developed a number of proposals to make the northern section of Royal College Street a safer and more attractive place for everybody. This leaflet sets out these proposals, and as a local resident, business or group, this is your opportunity to let us know what you think. Our analysis of this section of Royal College Street has shown that road safety is an issue. There have been 15 accidents within a 3 year period up until February 2014. This includes 2 serious accidents and 13 slight accidents. 5 of the accidents involved cyclists and 3 of the accidents involved pedestrians. The vast majority of the accidents occurred at junctions and mostly involve vehicles turning into the path of vulnerable road users. Speed surveys have been taken and the average traffic speed is 23.5 mph, which is in excess of the 20mph speed limit implemented boroughwide. This data suggests that cyclists and pedestrians would benefit from cycle lanes, better crossings and measures to encourage vehicles to drive slower. The Council is therefore proposing to extend the recent improvements on Royal College Street by introducing protected cycle lanes in both directions from Baynes Street to Kentish Town Road. The cycle lanes will narrow the street which should encourage slower driving speeds. We are also proposing to remove the traffic signals at Jeffrey’s Street and introduce new zebra crossings to encourage slower driving and give pedestrians more priority. Provide protected 1.5-2m northbound and southbound cycle lanes between Baynes Street and Kentish Town Road. There will be no loading or parking within the cycle lane at any time. The new cycle lanes would mean that the street would be narrowed for other vehicles. The number of traffic lanes would be reduced from two to one between Ivor Street and Jeffrey’s Street. Raising the road to the same level as the footway on Baynes Street and Ivor Street where they join Royal College Street. To provide a safe way for cyclists to cross Camden Road from Royal College Street, the traffic signals would be changed to provide a “protected junction for cycling”. Cyclists would get their own green signal to go north and south whilst all other traffic would be stopped on a red signal. These changes will result in minor delays to bus journey times. There will be a loss of one Pay and Display parking space between Baynes Street and Jeffrey Street. Motorcycle parking Between Baynes Street and Jeffrey Street would be relocated to Ivor St with some loss – 15m length to 10m. Signal changes to the Royal College Street / Camden Road junction would increase the pedestrian waiting times during the morning and evening peak periods, but all crossings points are retained. There will also be minor delays to east and westbound bus services at the junction. We are working with Transport for London to mitigate these delays though an investigation of the wider road network. The bus stop and pedestrian crossing outside Camden Rd Overground station would need to move a short distance away from its present location to facilitate our proposals. Adjacent to parking – Parked vehicles would provide a form of protection for cyclists. In these areas small rubber blocks or “armadillos” would also be installed (similar to those used south of Baynes Street on Royal College Street). There would also be a safe area between the cycle lane and the parked vehicles. Not adjacent to parking – small rubber blocks or “armadillos” would be installed (similar to those used south of Baynes Street on Royal College Street). There is not enough space on the street to provide kerb segregation throughout. The proposed segregation with “armadillos” would be significantly cheaper and quicker to install than kerbs. In addition, the “armadillos” would provide more flexibility for cyclists and less of a barrier to pedestrians crossing the street. In addition we wish to improve road safety and create more public space at the Royal College Street junction with St Pancras Way/Wilmot Place (College Gardens). The proposal seeks to reduce conflict between southbound cyclists and left turning vehicles into St Pancras Way. The Council is also proposing to improve the quality and accessibility of College Gardens and we will be sharing our ideas for this space very soon. Remove traffic signals at Royal College Street and Jeffrey’s Street junction and replace with one zebra crossing and two uncontrolled pedestrian crossing points. Left-only turn from Jeffrey’s Street into Royal College Street for motor vehicles. Retain one way traffic direction on St. Pancras Way as existing. Raise Royal College Street to footway level between Jeffrey Street and Farrier Street. Redesign junction at St. Pancras Way and Farrier Street where it meets Royal College Street to reduce speeds and improve safety for pedestrians and cyclists. Provide 1.5m cycle lane on St. Pancras Way. Close Wilmot Place to all traffic (except cycles) between Royal College Street and St. Pancras Way. Raise Wilmot Place between Royal College Street and St. Pancras Way to create an improved public space. Provide an uncontrolled pedestrian crossing point on St. Pancras Way leading to College Gardens. Remove 8 Pay and Display and 2 disabled parking bays parking bays from outside 65-335 Royal College Street. Relocate 4 of these Pay and Display parking bays to outside 126 St. Pancras Way (Total loss of 4 Pay and Display parking bays and 2 disabled parking bays). Relocate 7 resident parking bays on St. Pancras Way from adjacent College Gardens to across the road.